Measures speed, distance and GPS coordinates of passing vehicles and also calculates the travel time and distance between vehicles. All measurements are combined with a colour video recording and high resolution digital images. Has speed accuracy of +/- 1 mph and distance accuracy of +/- 6 inches. Speed range up to 200mph for approaching vehicles, and up to 320kmph for departing vehicles. Maximum measurement distance of 1200m and minimum measurement distance of 15.25m. 3.1 MP Camera Sensor. 7.4V DC lithium-ion polymer rechargeable battery providing up to 15 hours of cordless operation. Anti-jam feature to avoid automatic laser jammers. 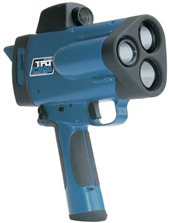 Tagged with: LTI 20-20 TruCam Speed Guns Traffic Enforcement Turbo Consultancy Services Pvt Ltd.